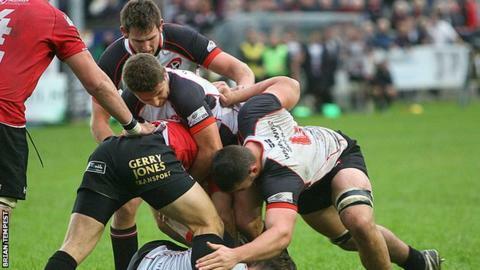 Cornish Pirates boss Ian Davies says the club's next three matches will show how far his side have developed. Pirates, 10th in the Championship, host sixth-placed Nottingham on Sunday before taking on Rotherham and Bedford, fifth and seventh respectively. "The next three games really are three important matches for us in the context of the whole season," Davies said. "We did well at the back end of the last block of Championship games and now this is a test of our development." Pirates go into the game having won four of their last five matches in all competitions, including league wins over and having lost their opening three Championship games. "We'll see where we're at and see whether we're making progress or not," Davies told BBC Radio Cornwall. "What's gone before we need to make sure it wasn't a flash in the pan and we have made those developments. "We feel we have, but the proof is in the pudding." The Pirates welcome back prop Paul Andrew at loose-head while Will Carrick-Smith and Darren Barry return to the second row.